Our modern interest in homesteading is more than a fleeting pursuit. In fact, I have an entire section of this site devoted to such endeavors! Between books like Homemade Pantry and Jam It, Pickle it, Cure It, columns devoted to DIY projects, and stores like Portland's Homestead Supply Company, if you're interested in making your own mayonnaise, growing your own vegetables, or raising your own chickens, the only resource you need to find on your own is time. The reaction to this renewed interest in homesteading differs among generations. While millennials are canning and preserving in droves, many baby boomers are baffled by their interest. As Emily Matchar details in the Washington Post, "My baby boomer mother does not can jam. Or bake bread. Or knit. Or sew. Nor did my grandmother, a 1960s housewife of the cigarette-in-one-hand-cocktail-in-the-other variety, who saw convenience food as a liberation from her immigrant mother’s domestic burden." But Matchar writes that millennials are embracing modern domesticity, and often with a sense of ethical purpose – as a response to and protest against industrial food, corporate control, and pollution. This is a generational divide: making one's own soap or detergent is now a choice, not a duty. Besides the allure of frugality, people pickle or garden because they crave a sense of accomplishment, along with a way to connect and bring order to their world. This generation, in which I'm firmly encamped, cans on the weekend, weeds during the week, and reads chicken-rearing books in coffee shops. Our generation has sprung from past generations that practiced this self-sufficiency not by choice, but by necessity. America is now in a curious position where this resurgence of homesteading and domesticity is at odds with our nation's sterile and efficient approach to manufacturing, food production, and general domestic pursuits. Why pickle a vegetable when you can buy vegetables year-round? Why raise your own chickens when a bin of chicken breasts waits for you at the grocery store? It remains to be seen whether an awareness of food production and of our impact on the environment will remain a niche movement or blossom into something our nation, as a whole, can embrace. No artist better captures this uneasy but hopeful question than illustrator Joe Wirtheim. 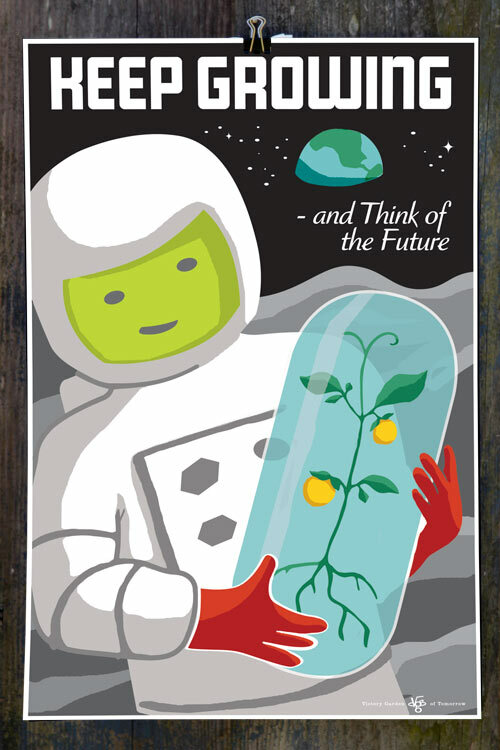 His self-commissioned poster campaign, The Victory Garden of Tomorrow, celebrates a "history that's been vacated". 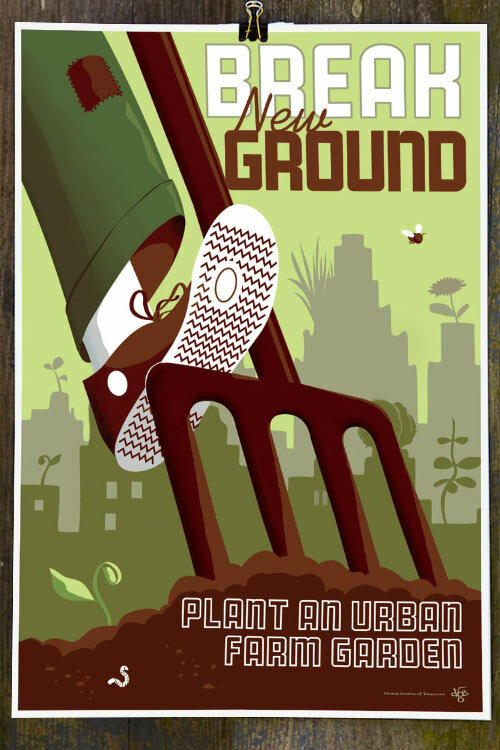 Using a style inspired by WWII propaganda and call to action posters, Wirtheim seeks to illustrate our current opportunity: a chance to make decisions--like gardening--that will positively effect our current lives and future generations'. As Wirtheim shared in person, our country experienced a similar moment right before WWII. At the end of the Great Depression and before the war, Wirtheim says that people were open-minded, attempting to figure out their role in society. In the late 1930s, farming wasn't monopolized by a few at the top, many homes owned their own dairy cow, and most families grew food and "put up" during the Fall. Americans were thrifty and innovative: in many ways, our collective consciousness was creative and community oriented. By the 1960s, this awareness and self-sufficiency segwayed into convenience, suburbs, and corporate dominance. During the Second World War, Wirtheim says, a connection between "maximizing production and duty to country was solidified", resulting in massive expansion of many industries, including the poultry industry. After the war, price supports for commodities were maintained but without production controls. When soldiers returned home from the war, they found and contributed to a changing society that included a mass exodus to the suburbs, interstate highways, a reliance on cars and grocery stores. This focus on individual efficiency extended to all parts of life. Wirtheim attests that we can now take the path we didn't take. He argues that one impetus behind the current homesteading movement is that today's youth sense a "vacuum" and are seeking to fill this void with substantial actions. If you live in Portland, you might have spotted Wirtheim's cards at New Seasons, People's Food Coop, or Land. His illustrative style stirs feelings of both nostalgia and optimism. 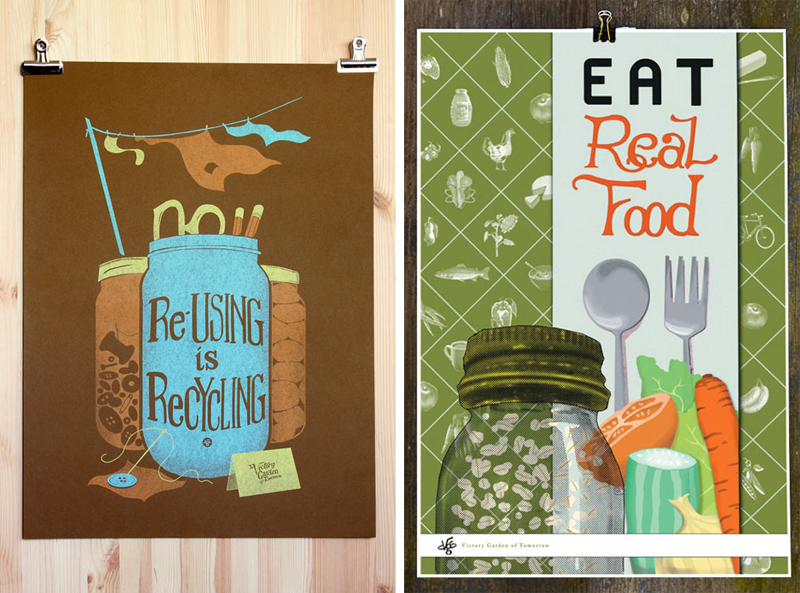 Before I was familiar with Wirtheim's work, I encountered one of his posters (specifically the "Grow Food on an Organic Farm" poster) while standing in line at the Urban Farm Store. I thought it was a replica of a vintage poster and remember thinking "it's a shame posters like that aren't made today". You get a true sense of Wirtheim's philosophy when you flip through his entire card collection. 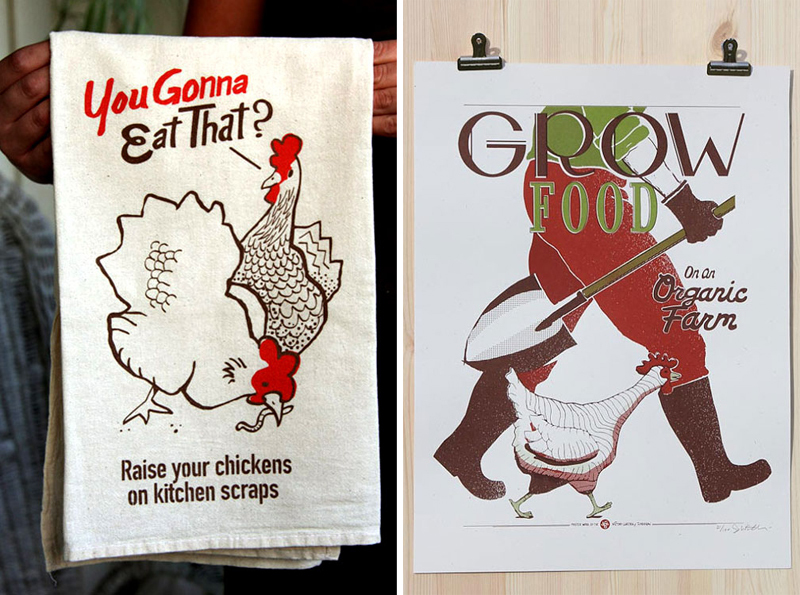 On its own, the organic farm chicken poster could be from another decade, but when I saw the chicken card grouped with a notecard like "Keep Growing and Think of the Future", I flipped back through all of the cards to understand his full vision. Wirtheim's bold illustrations ask: what can we do today that will be groundwork for tomorrow? How can we be active participants in society, and in building a better future? Wirtheim has a graphic communications degree from Columbus State Community College and a BA in Communication Studies from PSU. His belief that the millennial generation is both hands-on and curious directly relates to his own experiences. He's quick to point out that his adult life and inspiration behind "The Victory Garden of Tomorrow" is a reaction to his earlier environment rather than a continuation. He had a normal childhood in Ohio, eating standard 1980s American fare like hamburger helper and ham sandwiches, and started questioning society around him as he transitioned away from young adulthood. Before becoming an illustrator, Joe originally studied industrial engineering (and worked in organ construction). He shared that he was eager to rise up the ranks, but his career success wasn't enough to mask an unsettled feeling. Seeing a downtown unsafe after dark, juxtaposed with plastic wrapped foods, drive-throughs everywhere, and people who didn't seem any happier for all this convenience, led to uncomfortable questioning of industry, corporations, and poor infrastructure. Soul-searching isn't for the faint of heart. As you dig into the deep recesses of who you are, including your inspirations and intrinsic beliefs, you must find a way to reconcile conflicting feelings, especially if the surrounding world plays a role in that conflict. Wirtheim's growing cynicism took a more positive and hands-on direction as he and his roommates started growing their own food, and as he discovered an interest in graphic design. When Wirtheim moved to Portland, he immediately started working as a graphic designer. After a year of work, he returned to school, attending PSU to learn "more than he could imagine" about media, journalism, writing, and leadership. When he left school, he felt drawn to the idea of working and collaborating with others, only choosing to branch out on his own because the "business was there". He taught himself business administration and aspects of business he'd never even considered, like creating compelling packaging, eventually taking on two employees in 2011-2012. The Victory Garden of Tomorrow was created to rally American consciousness around sustainability, awareness, and accountability, without viewing these concepts in an overly nostalgic or cynical lens. Wirtheim's work has sparked change in unexpected ways. Besides receiving feedback from people who are visually inspired by his pieces and the idea of a sustainable, productive future, his work has had tangible effects in certain communities. For example, awhile ago, he heard from a woman in rural Illinois who used Wirtheim's "Keep Em Flying" poster to persuade her town to allow backyard chickens. 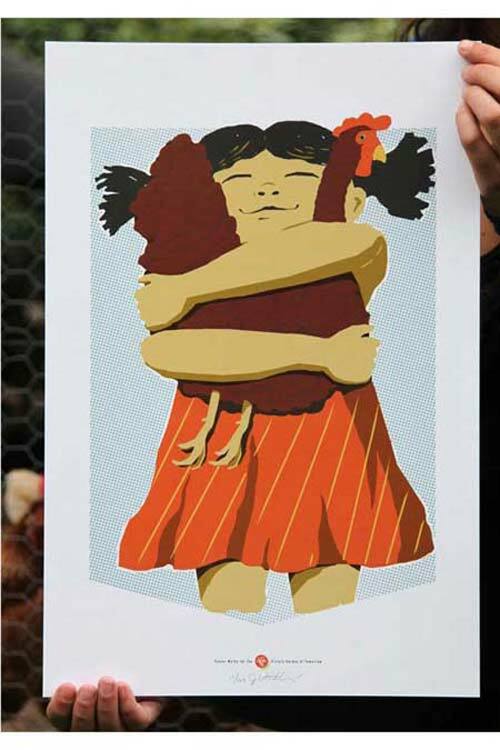 This story inspired Wirtheim's "Girl Hearts Hen" design. "Its easy to use nostalgia as a persuasive technique to affect people's thinking about who they are as Americans," Wirtheim says. "I try to be careful and not paint 1940s America as some kind of righteous moment. It was a moment when, we all must admit, some important stuff happened. America remade itself between the 1930s and 1940s, and that ambition is powerful and engages the imagination, even today. That is why I chose it as a touch point for my work – it is a period where the imagination was the limit. And I want that for today." Wirtheim's knowledge of history and sources for inspiration took an interesting twist last month, when he and his girlfriend Taylor embarked on a year adventure to teach English in South Korea. He's emailed that in between teaching and exploring, he's found a routine that allows for creative time. As homesteading and DIY grows more popular among younger generations, I think Wirtheim's philosophy encapsulates the soul behind the movement. My thinking is that the Millennial Generation is a more hands-on, clear question-asking generation. Does it make sense to eat like this, if older folks around me are unhealthy, maybe suffering because of it? they ask. [Along with] a desire to re-discover and engage in craftsmanship, you have a recipe for a decent number of people asking for alternatives. Everyone knows about Portland's rain, but you probably were unaware of the amount of daylight Portland receives.